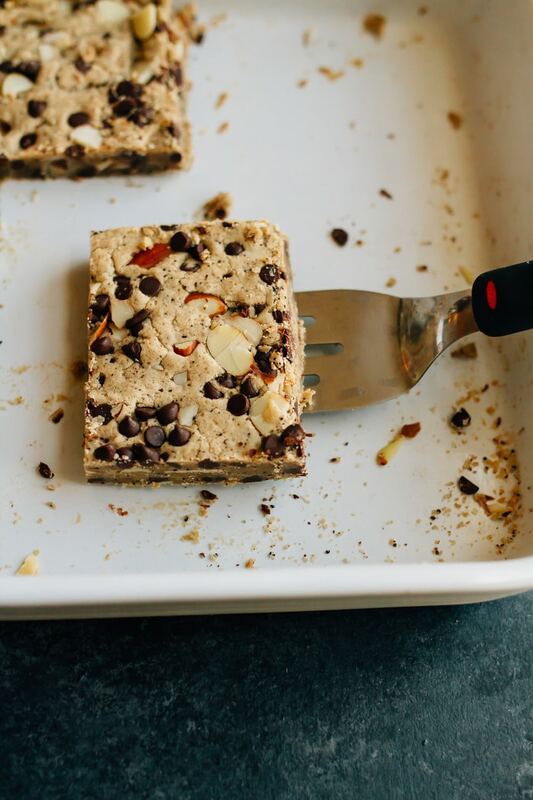 These amazing vegan coffee toffee bars are like a cookie but in bar form. 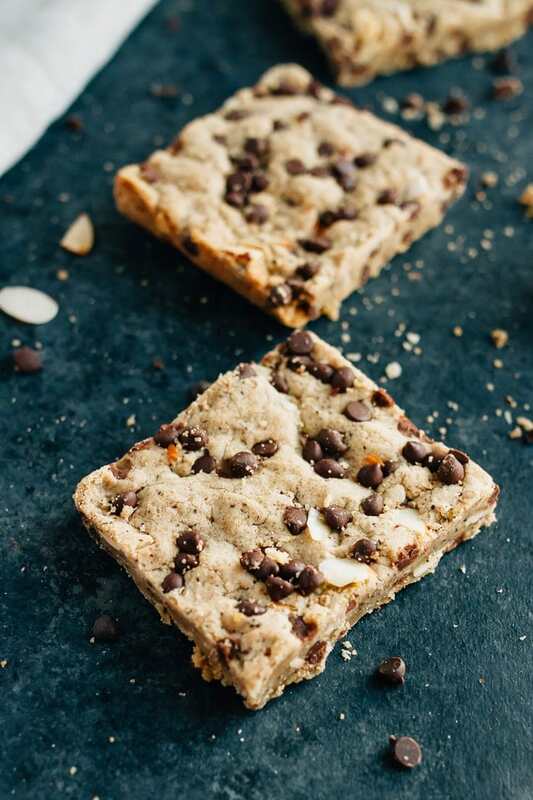 They’re loaded with almonds and chocolate chips and they have a subtle coffee flavor — perfect for coffee lovers, but not strong enough to turn away coffee haters! I’m sure you can tell, but I have a thing for coffee (I’m actually sipping a cup of bulletproof coffee as I type this). 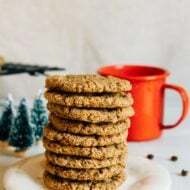 These almond butter espresso cookies were a huge hit last week and they reminded me of another coffee treat I posted ages ago… these vegan coffee toffee bars. This recipe came about after a day of baking with a good friend of my mine, Barbara and her friend, Ashley. Ashley is a baker by profession and invited us both over to her place for a day of baking and movie watching. We watched Toy Story 3, which really shows you how long ago this all transpired. 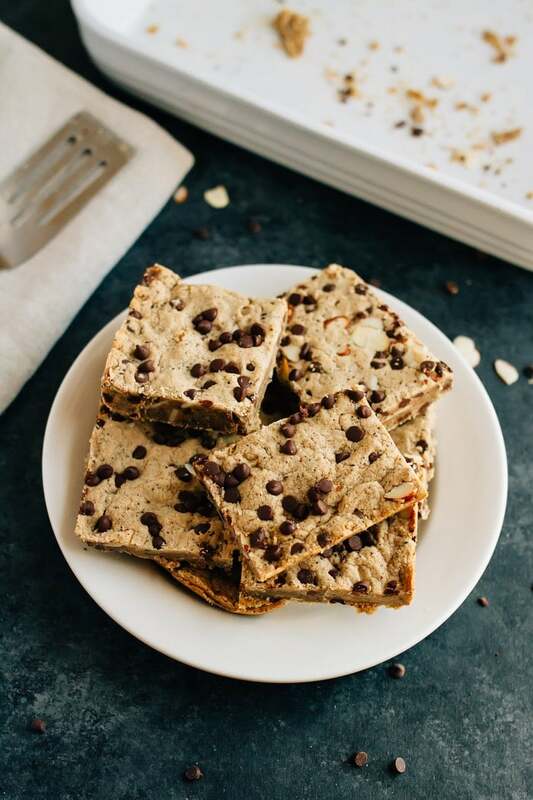 Anyhow, she taught us how to make these vegan coffee toffee bars and she agreed to let me share the recipe here on EBF as well. Which I’m still very thankful for because it’s pretty amazing! I made another batch of the bars this week to take new photos and gah, they are so rich, buttery and delicious. Just as I remembered. And no one would ever guess they are vegan! They’re definitely not the healthiest baked good I’ve ever posted on EBF, but they’re so darn good I have to share. 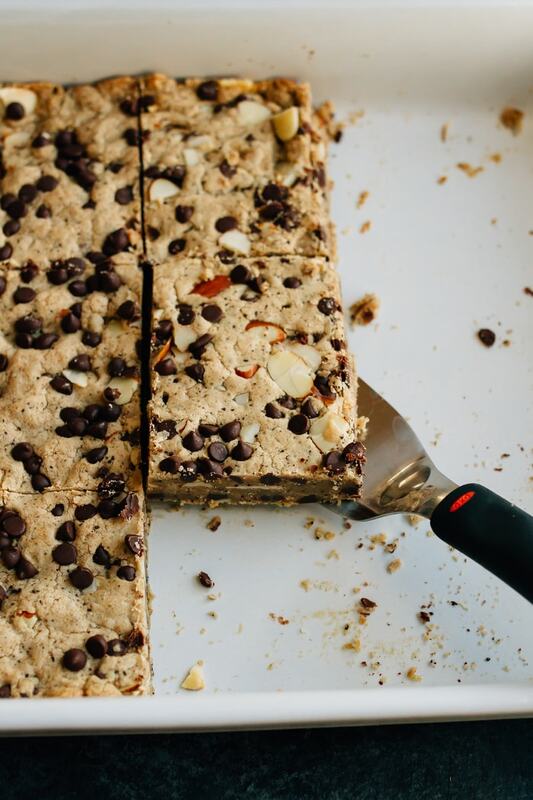 One batch makes 12-16 bars so they’re great for gatherings or parties, although they also making a great snack paired with coffee or hot tea. One tip — I know it’s hard, but let the bars cool for at least 20-30 minutes because they’re MUCH easier to cut and eat after cooling The chocolate solidifies, the bars harden and the edges get crispy. My definition of perfect! 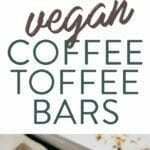 Like with all the recipes I post, if you decide to make these amazing vegan coffee toffee bars, please share a photo on social media so I can see your delicious creation. 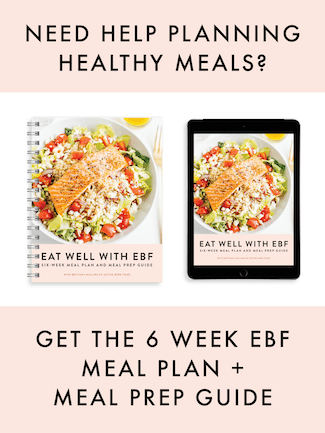 Just tag @eatingbirdfood or use the hashtag #eatingbirdfood so I don’t miss it. Cream the butter and sugar using a stand mixer, add in coffee and almond extract. Add dry ingredients into the mixer and mix until just blended. Lastly, add in almonds and chocolate chips. 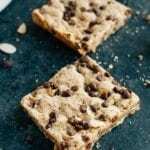 If needed, use your hands to toss the dough and press chocolate chips and almonds in. Grease a 9X13 pan and pour the batter into the pan. Batter is thick so use a spoon or your hands to spread batter evenly across pan and press it down. Bake at 350° for about 20-25 minutes or until an inserted toothpick comes out clean. Let cool for 20-30 minutes, cut and enjoy! *I haven’t tried these with gluten-free flour, but I bet an all-purpose gluten-free flour would work. What a fun weekend! Getting together with old friends is always a nice time. And these bars sond and look amazing. I love toffee. I’m not sure why I don’t use it more often. wow-those bars look delicious! love the kitchenaid mixer, too. Mmmmm toffee bars… it seems like everyone is making some sort of toffee bar or blondie these days. I might have to jump on that bandwagon. Love that precious doggie face and that cute polka dot plate! I think I’ll divide the recipe in half and use an 8 by 8 pan instead! I love sweets and I can’t help but make them, but that doesn’t mean I should have two 9 by 13 pans of the stuff around, haha! Thanks for such a tasty looking recipe. Halving the recipe would probably work out fine! And, I definitely know what you mean – I brought home a few of the bars to share with Isaac and I think I ate most of them. They were too good to resist. Omnomnom those look soooo good! those look so yum! I love the flavor of almond extract!!! 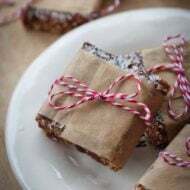 The toffee bars look even better on your blog! I can attest to their deliciousness and that Brittany did 95% of the baking. I was only there for taste testing and Toy Story 3 watching. I added you to the slew of other Food Blogs on my Google Reader! This is awesome! These look amazing. I will definitely be trying them! yum yum yum!! those look amazing!! thanks for the recipe!! Adorable. I love hearing about friends/family baking and eating together. And of course, you make me happy with toffee! I want to make and eat those bars right now! Thank you for sharing your words, your photos and your thoughts. I’m blessed to have you in my day! I hope you have a wonderful week, my friend! SO CHEWY, SO MOIST, SO SWEET!! 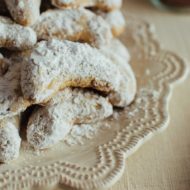 I love the pic of you cutting them, totally shows that they are soft baked as well <3 super scrumptious and pretty fabulous that they're vegan too! Go for it! I’m sure they would still come out delicious! 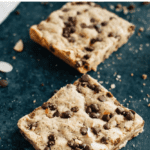 Holy YUM – these look INCREDIBLE! I didn’t know Enjoy Life made ‘chocolate’ chips! Awesome and the bars look great. Yes!! They are the best chocolate chips and you can find them at most stores now. I love the look of these, I’m a sucker for coffee! hi, i would imagine that converting this recipe to dairy — using butter instead of the buttery sticks — would be a direct swap. is this correct? thanks. I actually made these last night, and they ARE amazing! I also made them with regular (good quality) butter, so un-vegan-fied them, but I used the Enjoy Life mini chips, which I happened to have on hand, and a small packet of caffe mocha instant coffee from Starbucks that someone gave me a while ago but never used. I wanted to make a treat for my kids to bring to school as they are winding down the school year. Just wanted to note that there is a mistake in the recipe, though. You don’t include the step with mixing wet & dry ingredients, or the step of putting in chips and almond (unless I’ve missed it somehow). Still these came out just fine. Thank you Brittany, Barbara and Ashley for another great recipe! Hi Carla. Thank you so much for commenting and I’m glad the recipe turned out despite my oversight with the instructions. Not sure how those steps got left out! I hope the kiddos enjoyed the bars. I’ve always wanted to try Earth Balance…these look so good! 😀 My friend who’s vegan would love these. Passing them along!